Kettlebell Deadlift is an effective exercise to target the lower back area, glutes and hamstrings. It also hits the posterior deltoids, traps and upper back. 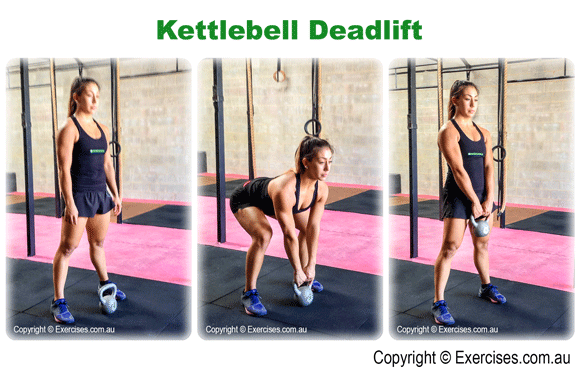 Kettlebell Deadlift recruits the muscles of the core section to support the lower back and maintain correct upper body position throughout the exercise. Kettlebell Deadlift will help build strength, stability and mobility in the posterior chain to reduce the risk of injury. It will also develop strength and power. Assume a hip width stance of a conventional Deadlift. Both hands on the handle of the kettlebell which is positioned between the toes. Starting the Kettlebell Deadlift with a rounded back puts the lower back in a vulnerable position. Another fault would be straightening the legs at the first pull. This places your lower back and hamstrings at greater risk of injury. With any variation Deadlift, you must always start the pull with your legs.